Maybe I'm the dummy but I have to admit that I've not always turned out perfect briskets (some were barely edible) and with the cost of a whole packer brisket these days, who can afford to buy something that's just going to be another mistake. Allow me to input, however, that there is absolutely no substitute for practice. Forget everything you thought you knew about preparing and smoking brisket and let's jump right into it. I have been using my original rub recipe on briskets for as long as I can remember and I make no bones about saying it makes for a lip smacking good time. 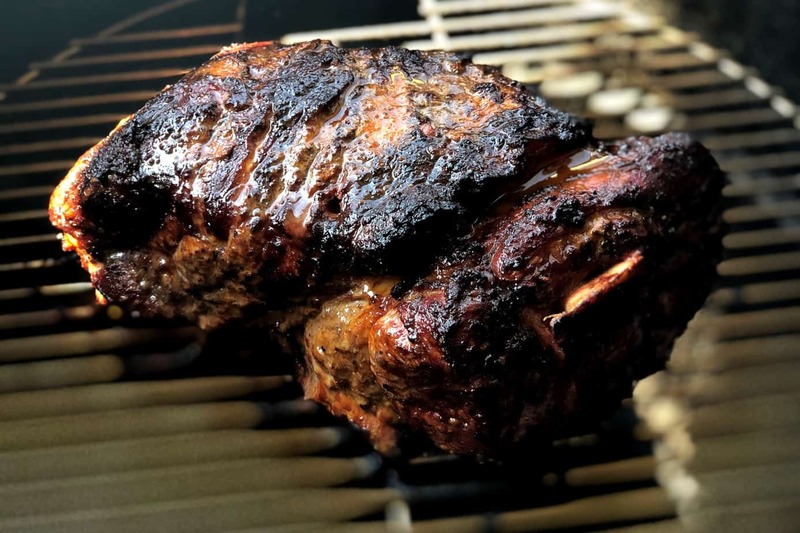 You special folks down in Texas and thereabouts who “don't like sweet rubs on your beef”, use my Texas style rub recipe (yep, I made it just for you) 'cause it don't have any sugar in it– it's just nice and savory! 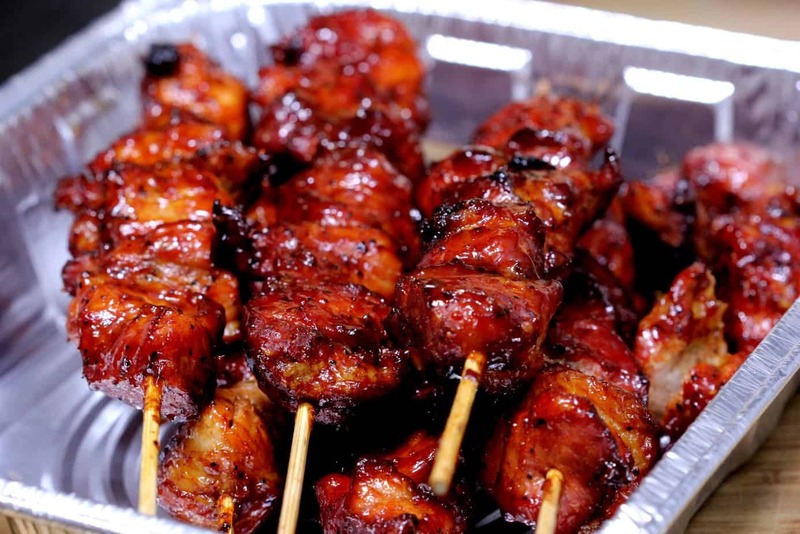 I promise you'll love my dry rub/seasoning recipe and my barbecue sauce recipe or you don't pay! This is probably the most comprehensive guide that I have written in a newsletter on a single type of meat so don't get blown away. You do not have to read all of it at once and, in fact, you might be able to digest the information better if you read it in several sessions and give yourself time to absorb the information slowly. I always tell folks, when purchasing meat, to buy the best thing you can afford. 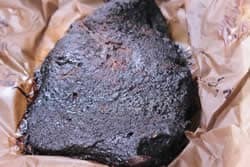 With current brisket prices one feels like they may have to take a out a small loan but often, you also get what you pay for where brisket are concerned. The cheaper box store briskets are often very low quality and there's only so much you can do to make it turn out wonderful. Part of how it turns out has nothing to do with you and everything to do with the cow, how it was raised, what it ate, etc. Picking out the perfect brisket starts with making sure you buy a whole packer brisket in the 12-14 lb range. This is the range that has given me the best results. The brisket should have a fat cap on one side.. sometimes about ½ inch thick or more. 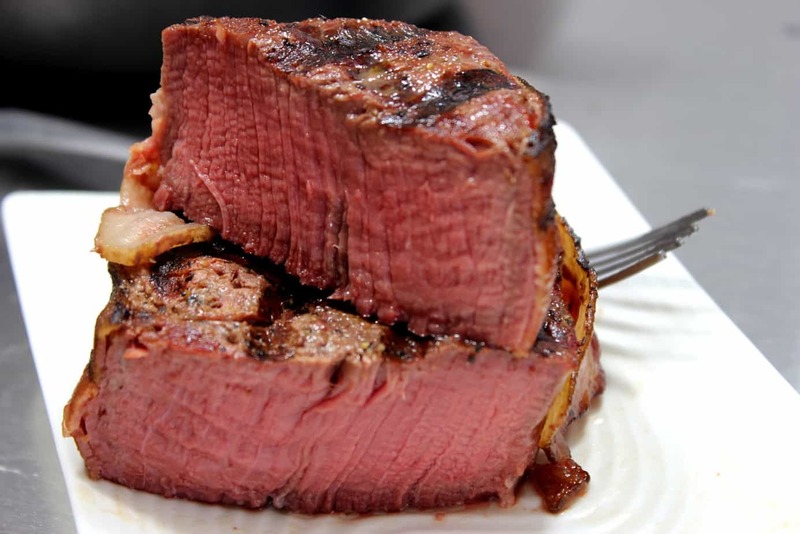 If you can find a large one that has a less thick fat cap, then theoretically you are getting more meat. Less fat weight = more meat weight. You need the fat cap but since I usually recommend trimming it down to about ¼ inch, there's no sense in buying more than ¼ inch unless you have to. Good red color in the meat.. off colors like brown and grey can mean the meat is not as fresh as it should be. Fat color matters as well or so I am told by folks better versed on the subject than I am. White or cream colored fat means the cows were fed corn and other cereals and is also likely that they were kept in a smaller area and not allowed to move around so much. Bad for the cow, but good for the consumer as less movement means more marbling of fat and meat that is not as tough. I have always thought that a brisket that starts out tender will be more likely to end up tender after it is cooked. For this reason, I check the briskets for “bend” in the store before I buy them. This is sometimes hampered by the tight cryovac packaging but it helps to at least give you an idea. The briskets that are able to bend the best are considered to have the most potential for ending up tender. Whether this is actually true or not is left to be determined by the food scientists of the world but it seems to be a consistent indicator for me so I continue to use this method faithfully. Some folks do not trim their briskets at all– no matter what. I recommend leaving about ¼ inch of fat on the top. Any more than that just hinders the smoke and insulates it from the heat so it is best removed in my opinion. Use a very sharp knife and don't get too meticulous with it. If it's the first time you've ever trimmed the fat cap, it might look like the cat gnawed on it and as you get better with practice, it will look more like it was done with a sharp knife in a purposeful fashion. Sometimes there's a really thick chunk of hard fat between the point and the fat along the side. I usually try to remove a big portion of that if possible. This is only relevant if you decide to cook the brisket with the fat cap in the UP position and I will talk about that on down the page a bit but, for now, let's assume that you are. Years ago when I first started doing briskets, the idea was to just put mustard and rub on the top, sides and bottom and call it good but I noticed that the rub was getting carried off by the melting fat and I knew that I either needed to just skip the rub on the fat cap or find a way to help it hold on a little better. This is when I started scoring the fat cap to give the rub a place to hang on while the fat was melting. To score the brisket, I simply made cuts in the fat cap all the way down to the meat in a crosshatch pattern with the cuts about ¾ to 1 inch apart. It worked great and the rest is history. 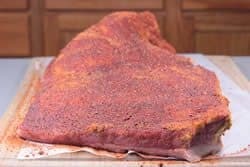 Another problem that you will encounter once the brisket is finished cooking is that you will want to cut it across the grain to make it more tender. The cutting is not the problem but remembering which way the grain runs now that there is rub crusted onto the brisket. This is where the notch comes into play. Cut a piece of brisket from the corner that is exactly perpendicular to the grain of the flat side of the brisket. Once the brisket is done cooking, you'll know the direction to cut the slices. Some folks like to keep it really simple and just use salt and pepper but to me, there is so much more than you can do. Brisket is a big piece of meat and it can handle a lot of flavor. Not only can it handle a lot of flavor, it begs for it! 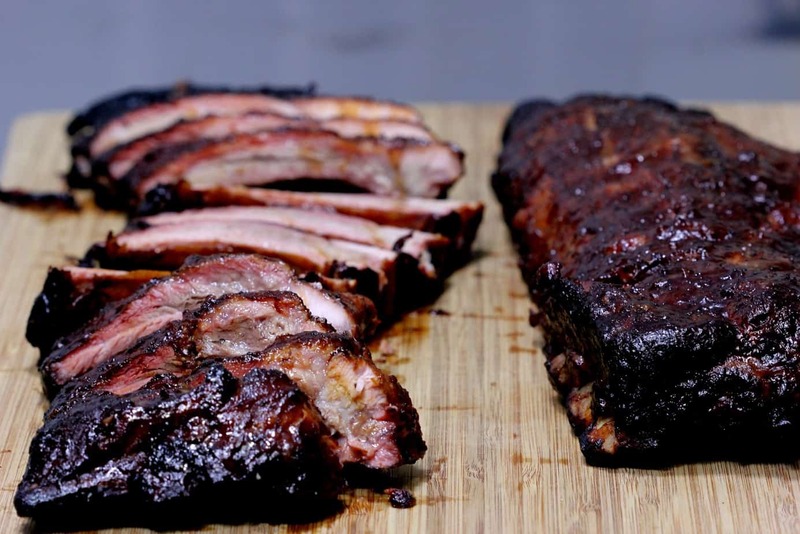 I use my original rub recipe (purchase recipes here) on brisket most of the time but that's because I like the perfect balance of sweet and spicy and I think it pairs really well with the beef. 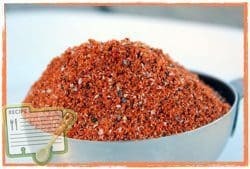 If you are a true Texan or just think like a Texan, you might prefer my Texas style rub recipe (purchase recipes here). 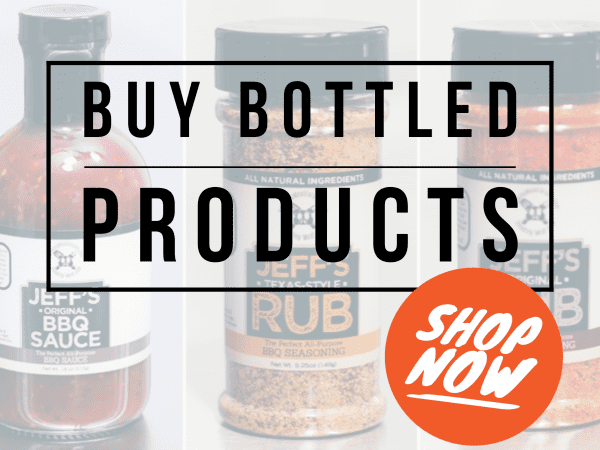 As most of you know, I sell my rub recipe to support the website and newsletter. I created the new Texas style rub recipe due to so many folk asking for a non-sweet rub and I decided to just include it for free when you purchase the original rub recipe. 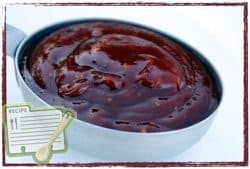 Note: In case you are wondering, the rub recipes and sauce recipe are delivered via email and should be sent to you within minutes after you order. I also offer it free of charge to anyone who has already purchased the original rub in the past. All you have to do is request it. When applying rub, you have two basic options. Pour the seasoning onto the meat and hope it sticks. Much of it will fall off when you move the brisket. Use something on the brisket that is sticky that the rub can adhere to. I like option 2 with yellow mustard as it works really well, does not taste anything like mustard after it is cooked and it's inexpensive. Apply a good layer of mustard.. get artsy with it if you are so inclined. Apply the rub and watch it stick like glue. 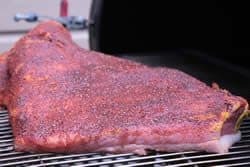 Note: I usually apply the rub on all sides however, if I am cooking fat cap DOWN, I do not go to the trouble to place rub or mustard on the bottom of the brisket. It just seems unnecessary. I love cooking briskets on my Meadow Creek wood smoker however, that is labor intensive and requires lots of babysitting. I don't mind the process if I have nothing to do and I'm in relax mode but, if it's a busy day, I will often use a propane smoker such as the Great Outdoors Smoky Mountain or even an electric model such as the Bradley, Masterbuilt or even the electric Brinkmann (the red one). I also love to use the Weber Smoky Mountain (WSM) or the Big Green Egg for brisket. 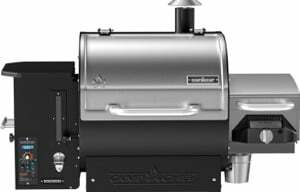 Both of these are charcoal smokers, impart great flavor and are quite easy to setup and use with minimum labor involved. Fat Cap UP or Fat Cap DOWN? Everyone has an opinion about this and I'll just give you mine. I have cooked them both ways upon many occasions and I can't tell that it makes a huge difference in tenderness, flavor or juiciness. I do it both ways and I even have a method where I flip it back and forth while it cooks. All in all, you should try it both ways and see what works best for you. There's always a caveat and here's one– if you are using a smoker where there is lots of radiant heat coming straight up from the bottom (think ugly drum smoker with no baffle) and onto whatever you are cooking, then fat cap down is the way to go since it will protect the brisket from the blast of heat and keep it from drying out so bad. 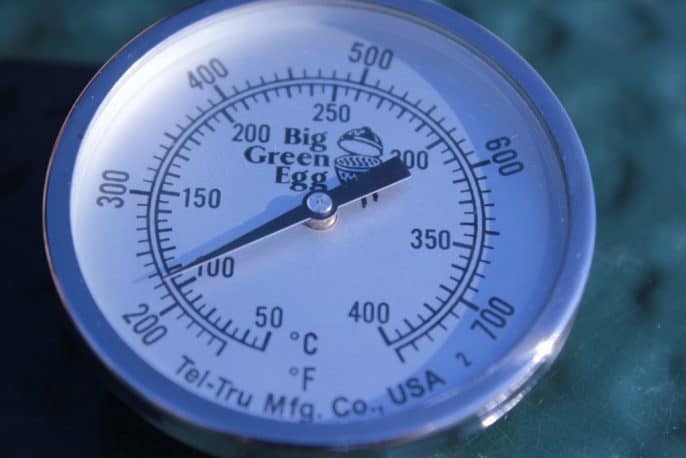 Use a thermometer to test the temperature of the brisket and even though there is some “feel” involved with knowing exactly when a brisket is done, this is no replacement for knowing the exact temperature in my humble opinion. I highly recommend the thermometers made by Thermoworks as they are proven to be high quality, super durable and highly accurate. I have several of their products and I have not doubt that I'll still be using all of them 10-20 years from now.. probably longer. Buy a good one that's sure to last and you'll be much happier in the long run. 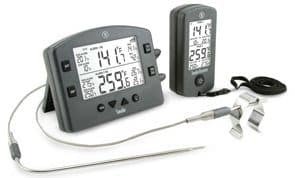 The Thermoworks Smoke is my favorite dual probe, remote digital thermometer. The probes are left in the meat the entire time it's in the smoker so you always know what the temperature is. There are (2) probes so you can monitor two pieces of meat or a piece of meat such as this brisket as well as the pit temperature. 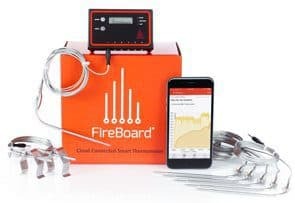 They also have a gateway that connects this thermometer to your wi-fi system and this together with an app on your smart phone can allow you to monitor the dual probes even when you are not home. I love going to the store to get supplied and being able to see the temperature of my smoker and the meat I am cooking. That's REALLY sweet! I won't spend a lot of time on this but I have many people ask me questions regarding how long to apply smoke and my standard answer is that I recommend you apply smoke for at least half of the estimated cook time. This does not apply to wood smokers obviously since they use wood for fuel and will be creating smoke by default whenever it is in use. This is my minimum and does not mean that you absolutely have to stop the smoke at the halfway point. This is just what I have found and seems to be the minimum amount of smoke needed to create a good smoke ring and great flavor. As long as you keep the smoke light, you can apply smoke to brisket for the entire time. You may find that you like only 30 minutes of smoke and that is fine too. You have to figure out some of these things by practicing your craft. 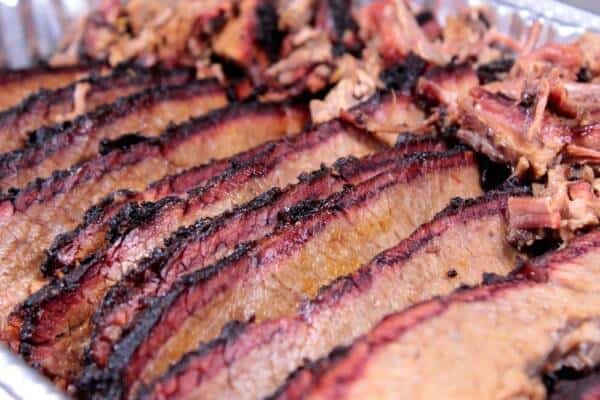 I like to use hickory, pecan or oak on briskets although I have also used cherry and even mesquite with excellent results. In case you are wondering, it is perfectly fine to finish cooking the brisket in the home oven at 225-240°F once you are done applying smoke. Be sure to place it in a large foil pan to protect the house oven from any leakage issues. If you have not experienced this then perhaps you've heard folks talk about it. Something happens when briskets hit about 160°F. The temperature just stops going up for a few hours and it just sort of stalls out. We know that this is a result of liquids pooling on the top of the brisket and the evaporation begins to cool the brisket preventing it from rising in temperature for a while. You can expect this to happen and most of the time it does. 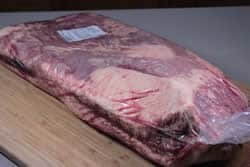 A great way to prevent this and/or to at least speed up the cooking process is to wrap the brisket in foil or butcher paper at about 160°F. I like butcher paper better than foil as it keeps the brisket crust from getting soggy. This is only an issue if you prefer the crust to be.. well, crusty and not soft. 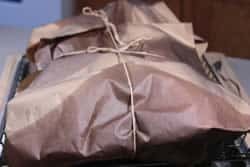 Many folks do not wrap the brisket at all. This is fine and you just have to prepare to be patient as the brisket does it's thing. I can't say that foil or paper makes a brisket better as I have not experienced this but it does cut off some of that stall time. This can depend on the brisket and as I mentioned above, there is some “feel” to knowing when a brisket is done but in my experience, for a super tender brisket, I recommend taking it all the way to 200°F. When a brisket is done, the meat will not resist a semi-sharp object being pushed through it. I usually check the temperature with a Thermapen and the resistance with which the probe goes into the meat and then comes back out lets me know how close it is to being finished. It should be like a knife in hot butter.. almost no resistance at all. If you did not wrap the brisket while it was cooking, I highly recommend wrapping it and placing it in an insulated cooler for a couple of hours once it's finished cooking. I usually wrap in foil or butcher paper then in a couple of old towels and place it down in a insulated picnic cooler. Sometimes I will place more towels on top to help hold in the heat and close the lid. (this is also great for traveling with the brisket as long as your are not going more than 3-4 hours away. The meat will stay hot for 3-4 hours if you need it to. A couple of hours allows the juices to redistribute throughout the brisket so that when you cut into it, it doesn't all run out onto the cutting board. I love brisket almost any way and this includes chopped as well as sliced. I love to serve chopped brisket if I am making sandwiches. Sliced brisket works great as an entree as well as on a sandwich. To get ready to slice or chop the meat, I recommend separating the flat from the point. This is done by running a knife along the fat layer right in the center of the 2 parts. The thicker end (the point) contains a lot more fat and extends into the center of the flat. I usually cut off the point from the flat, right down through it with it sitting flat on the cutting board. This allows me to see the fat in the center and I can run my knife right through it. The point can then be cubed up, placed back into a pan with added rub and sauce for making burnt ends (I love these). Put them back into the smoker for about 2-3 hours, stirring around occasionally until they get really nice and caramelized. The flat should be sliced about ¼ inch thick across the grain. Remember that notch we made earlier so we could tell which way the grain runs? Now you realize how good of an idea that is. If you have to make a brisket ahead of time and you plan to eat it later, I recommend no more than a couple of days. Go ahead and slice or chop it when it's done and place it in a foil pan with foil over the top. This way it's ready to heat up in the oven. 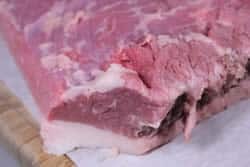 Catch some of the brisket juices if possible and pour that over the brisket slices and down into the pan.When it' s time to reheat it, preheat the oven to about 275°F and then place the pan with the brisket in to the oven. 45-60 minutes most likely but this depends greatly on how cold the brisket is, how much brisket is in the pan, how tightly it's packed, etc. You'll have to lift the foil a little and reach in there to feel it when you think it's almost ready. With it being in the pan with brisket juices, it will steam and maintain most of it's moisture during the reheat. It's also a good idea to reserve some of the brisket juices aside to pour over the brisket just before serving. Just bought your book and your recipe. I love it so far. I tried my first brisket this past weekend and everything was great but it was dry. When I sliced it, all of the juices came out. I let it rest in foil for 1.5 hours. I noticed in some articles you recommend setting in a cooler for 3-4 hours and then in your book you slice it after it has rest for 30 minutes. What’s is the difference in the two methods? How does each affect the meat? Thank you! Letting it sit in a cooler for 3-4 hours will further tenderize it however, the main reason for allowing it to rest is to allow the juices to settle down. When the brisket first gets finished, it is near boiling and the juices are under a lot of pressure. During the rest, the meat and juices cool and redistribute throughout the brisket. This way when you cut into it, most of the juices stay in the brisket instead of just draining out quickly. Usually a 30 minute rest is sufficient but it never hurts to let it rest longer. Truth of the matter is, some briskets just don’t have enough fat marbling within the meat to keep it moist. For this reason, I usually recommend catching some of the fat juices that render so you can pour that over the meat just before serving. Thank you so much for the helpful feedback! I will be sure to try it. I am going to make a few more of your recipes this weekend! I really enjoy this book! Thanks again! Cooked 5 lb brisket flat for 10hrs. Put in foil after 7. Prepped with an injection of Worcestershire sauce garlic powder and onion powder. Then used your rub and made the BBQ sauce. The sauce had great kick to it. Best brisket ever. Family loved it and great way to start the new year!! Do you guys/gals spray the brisket with a liquid such as apple juice/cider vinegar during the cooking/smoking process? Also should the water bath be flavored liquids or just plain water, thanks! Some do and some don’t.. I usually don’t but I have nothing against it. If you spray on something that has a little sugar content to it, it can help create a nice crust over the long cook time. I use plain water in the pan. 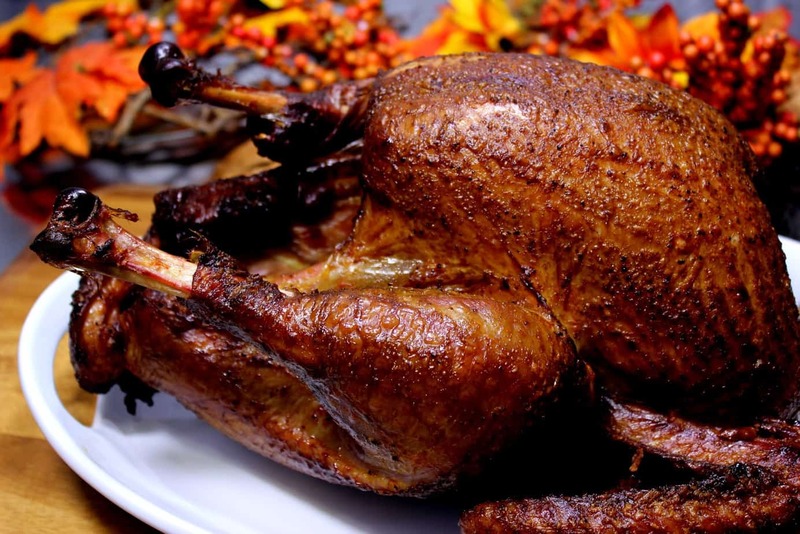 Hi Jeff – love the website and recipes! 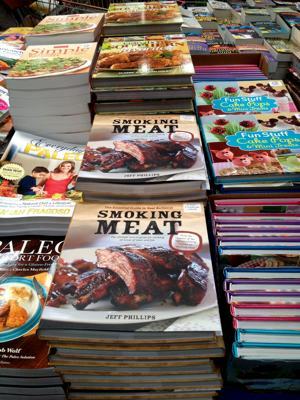 Question: are your rub and sauce recipes included in your book? The (2) recipes that I sell on the website and in the newsletter are not included in the book. We have opted to keep them separate since so many people have purchased them prior to the book being published. I do offer a coupon to book owners for $4 off the purchase of both recipes. Simply send me proof of purchase (amazon invoice, picture of you holding the book, etc.) and I will send you the coupon code. Marbling of beef comes from genetics , not so much what you feed the animal, nor whether it moves around a lot. Genetics also plays a part in tenderness of the meat,as well as how young animal is when they are finished. Young animals have white fat, as they get older the fat will yellow. Grain fed animals will have finish at a younger age, younger animals will be more tender. Most beef cattle in Canada and the USA are finished under thirty months of age. Grass -fed cattle will tend to be older when finished. 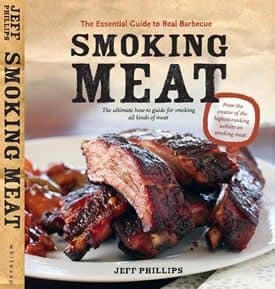 I don’t know anything about smoking meat, I rely on websites like this. But, I do know abit about cattle. of brisket at a time. 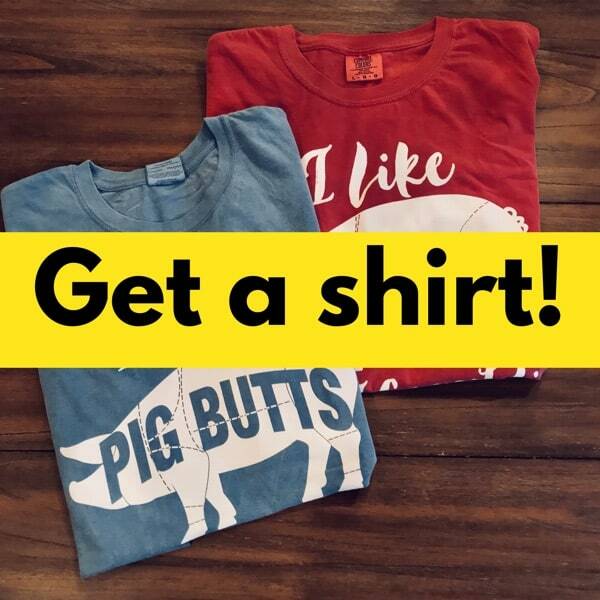 It seems to be a hit because people continue to ask for it. I’m just a beginner so I’m not sure what you mean by “water bath”. Please elaborate. before you know it. Water should be coming out of the drain hole in the pit along with oils and such. I’ve cooked many, many briskets and even with my long experience they sometimes are not a s good as my best was. All the tips above are solid and on point but I cant stress enough three things- don’t over trim, fat is our friend but do trim the hard fat. Its doesn’t render and just gets in the way. Also take it out as soon as it hits 198-200F and let it rest for at least an hour or two.